Undergraduate Student Government presidential candidate and Sen. Daniel Million submitted a notice of resignation from his senatorial position, according to USG Vice President Austin Dunn. Under USG bylaws, the resignation will go into effect in three weeks. The resignation letter came on Wednesday, the second day of voting during an already eventful election season. Million cited feeling excluded as the main reason for his resignation, in addition to reasons related to diversity. "I've always kind of felt uncomfortable with the organization, stated my concerns," Million said. "I didn't feel like anybody, you know, paid attention to them." Million said he had originally felt excluded when he wasn't able to vote during the Sept. 20 Senate meeting. He and Sen. Tingyee Chang hadn't passed their parliamentary procedure quizzes and weren't allowed to vote as a result. According to rule II.1.M of USG's bylaws, senators must attend a workshop on Senate meeting rules and score 80 percent or higher on a test of those rules administered during the pre-meeting. If a senator does not pass, then he or she must take the test again during subsequent pre-meetings, held each week, until passing. The bylaws do not explicitly state whether or not senators can participate in voting if they fail the test, or how many times a senator can fail—the Senate largely acted on precedence, which was that senators weren't allowed to vote, according to Sen. Emily Lee. "It was kind of a messy thing, but we more or less agreed that, if we did not pass, we would not be able to vote," said Lee. Million and Chang brought up their grievances with not being able to vote at that September meeting in the following week's meeting. The other senators decided to allow them to retake the quiz once, after which they would have to meet with the USG Parliamentarian if they failed again, according to the Daily Trojan. Million said he reached out to Dunn, graduate advisors and the Senate about his grievances in the fall of 2016 three times—in person, via email and during that meeting—and received little to no response. He said he then "gave up" on having his concerns addressed. Sen. Emily Lee was able to confirm two out of the three correspondences that involved the Senate. Annenberg Media has been unable to verify the meeting that Million said consisted of himself, Sen. Chang, the graduate advisors and Dunn as of this writing. Months later, Million decided to resign, saying that the decision was a long time coming. As for why Million chose to resign on the second day of the election, he said that "it just came down to now … It just happened." He doesn't believe that his decision will make an impact on his run for president. Million hinted at resigning last week at a Judicial Council hearing that ultimately resulted in sanctions on the Austin/Morgan presidential campaign after Dunn was shown to have engaged in a "willful violation" of election rules. 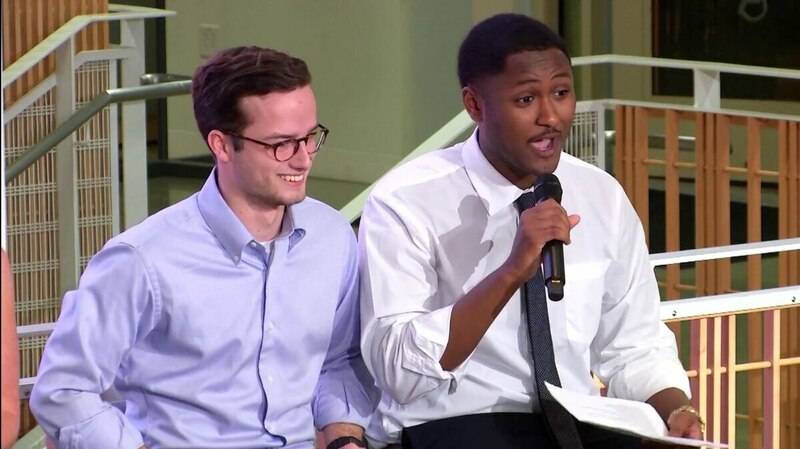 "I'm going to reconsider staying in the organization after hearing all this knowledge," Million said at the hearing, saying that he wasn't "comfortable" in his position when Dunn, the current USG vice president, was willingly breaking the rules. Dunn and his campaign declined to comment on Million's resignation. Despite his resignation from Senate, Million is still running for USG president, hoping to improve the leadership of the organization by "making students feel more included." He and Vorhoff aim to increase student involvement and make sure no one feels the way Million felt in Senate. Though he resigned, Million doesn't feel as though his decision reflects on USG as a whole. "It's just something that gives me more peace of mind," said Million, "until the organization sees more reform." Reach News Editor Sharon Zhang here, or follow her on Twitter here.